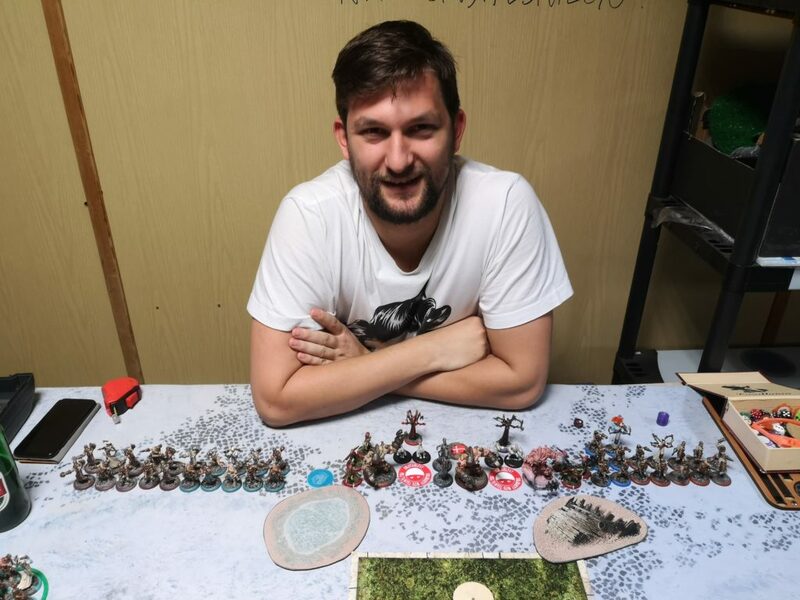 I decided to play versus Thexus again, this time I faced Tomasz Tutaj during our weekly Wednesday gaming evenings, back in December. I hoped that this time it will go better than previously with Thagrosh2. As you can see there are plenty of models and I knew the game will end tight on clock, in 6th or 7th round. 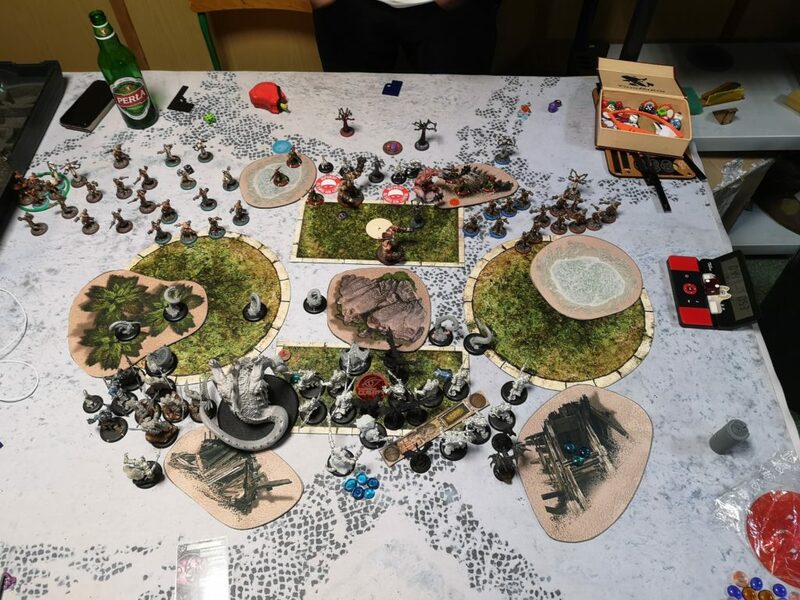 Unfortunately, the terrain (the wall, the objective and the impasable terrain in the middle) prevented me from placing Blightbringer somewhat centrally, so I put him closer to the left flank and decided to focus on capturing this part of the table. I placed Ogruns and Warspears around the gargantuan. Gorag’s pack was placed on the right flank, so I would be able to charge from behind the wall. By then I was already starting to feel comfortable with playing Anamag and I knew what was important and how to plan turns. I tried not to lose too much time in first round, what sometimes can spoil the whole game, especially since I knew it will be tight on clock. Everything run forward, outside of threat ranges with couple of exceptions probably. Blightbringer put aura +2ARM. 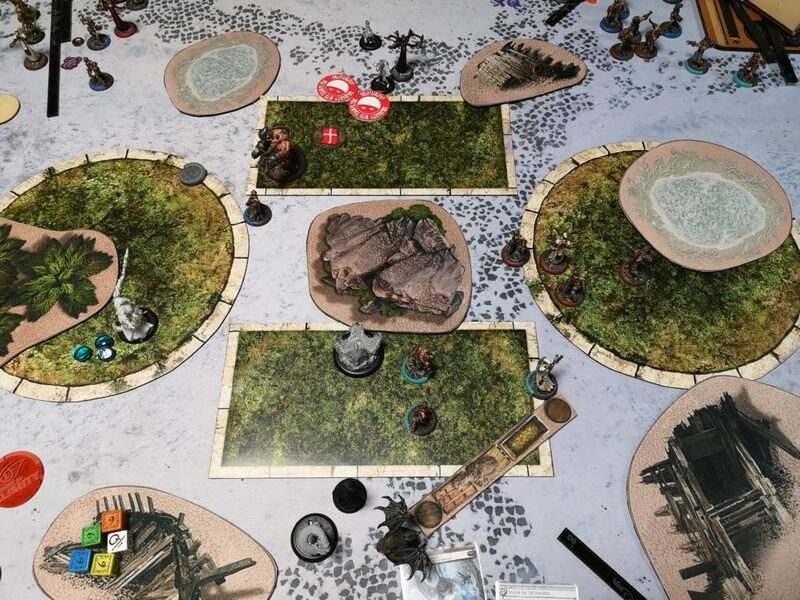 Birds flew in between models with the intention of not blocking Ogruns. I put the +2ARM spell on Gorag’s gang. Tomasz run forward, keeping in mind to not to expose himself to any drags. Drudges spread evenly across the table and covered almost half of it. With not so many models within my threat ranges I had to expose myself and sacrifice couple of Ogruns. The point is not to exagerate and put forward as many models as it is absolutely required keeping the rest in the reserve. I shot down couple of drudges on the left flank. I run forward with couple of Warspears and Ogruns keeping them in the aura and stayed with the rest in the back. Tomek decided to go in and planned the turn carefuly. The outcome was terrifying I must admit. I lost most of my models on the right flank where only Gorag survived due to long charges. On the left flank I lost couple of models but fortunately I passed 3 tough rolls, what kept me in the game there I believe. Thexus stayed safe in the back, so the CK was off the table. 1:2 on scenario. The situation on the right flank became desperate right away. I knew I was not going to last long there. On the left flank the Ogruns that rolled the toughs shredded havoc. I almost managed to clear the zone, only one drudge toughed and I coulnd’t score a point there. I managed to kill one Warden with Warspears and damage the other one. 2:2 on scenario. In his turn Tomek finished my right flank and managed to kill a considerable part of my Ogruns on the left flank. The tides of the battle were changing. Tomek unfortunately killed one of the beasts himself. 2:4 on scenario. Yet again I failed to clear the zone and a single drudge remained. I had to run with my Blightbringer in order to properly contest the enemy’s rectangular zone. I kept contesting the right circular zone with a Tentacle and scored one point. 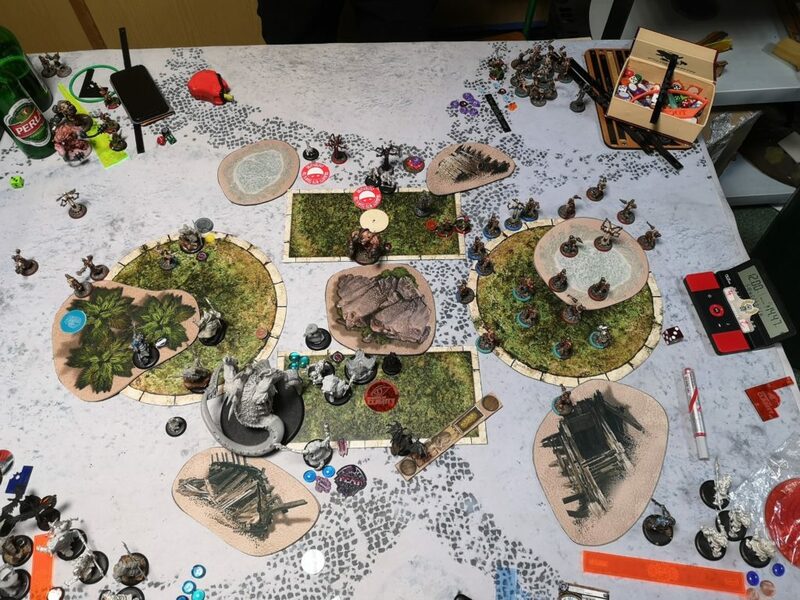 3:4 on scenario in zombie’s advantage. Tomek cleared my Ogruns in his rectangular zone and tried to hur my Blightbringer. 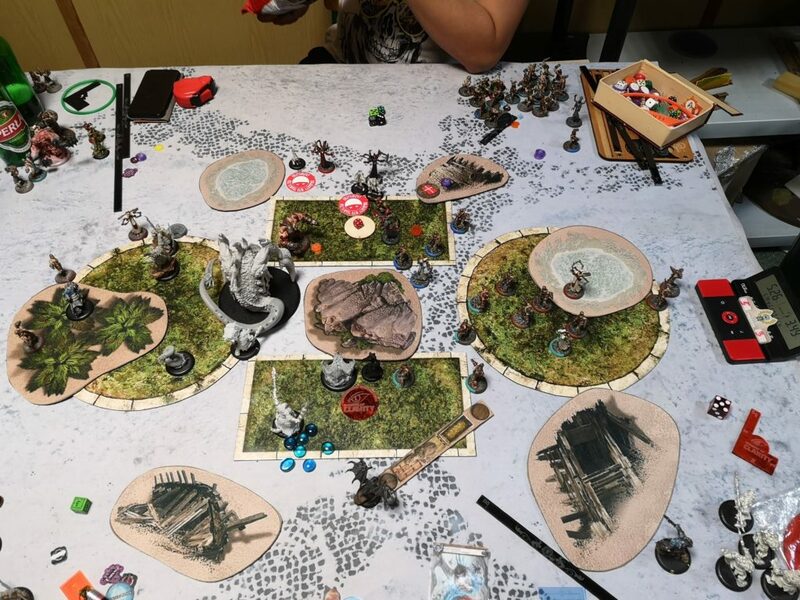 I lost some time on resolving my animus sprawy attacs agianst Warden, but then we realised that he would get another focus points and we decided it all didn’t happen 😉 The left zone was still contested and Tomek scored one point in the circular zone, 4:5 on scenario. I was running low on clock and I was desperate to get more points, so I decided not to attack Warden with the Blightbringer, but just kill the objective and models surrounding it with a shot, what fortunately happened. I cleared the left circular zone and scored a point in my rectangular zone, 3 point to me, yeey! 7:5 on scenario in my favour. 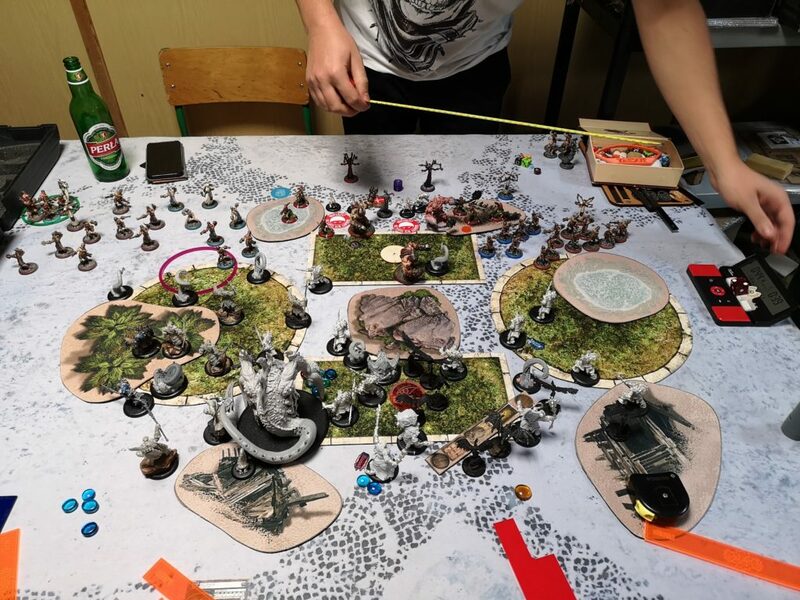 Tomek finally managed to finish off my gargantuan and contested all the zones. He failed to kill the objective though. 2 points to Mercs, 7:7. We were getting low on clock, so we forgot to mark the points on the point marker on the right. 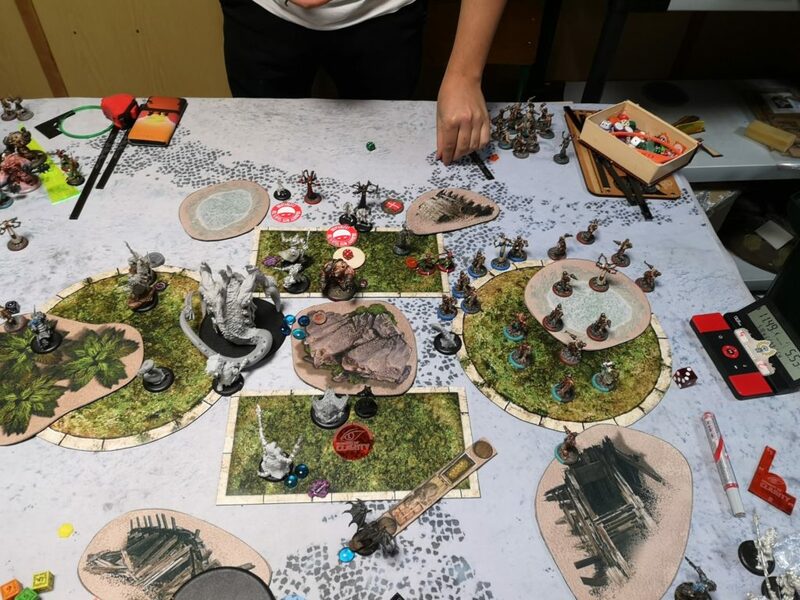 I had only 1.10 minute and had to kill couple of models in order to score 2 points. I had to contest the circular and the rectangular zone too. I’m afraid I didn’t take the photo of that turn. I managed to clear the circular zone and contest the other one, but I couldn’t clear my rectangular zone, so I scored only 1 point, 8:7 in my favour. Tomek was getting ahead on attrition. 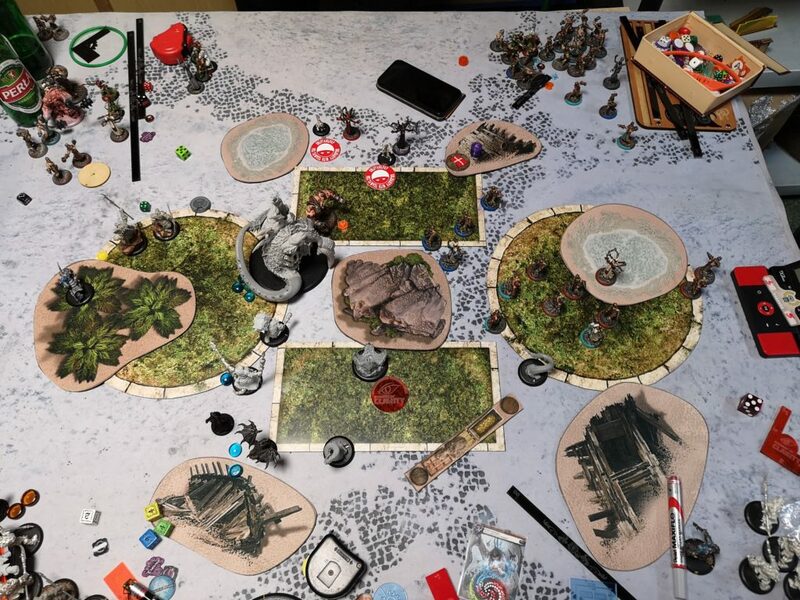 He managed to kill the remaining Ogruns and kill all contesting pieces and the objective scoring 4 points in his turn, 8:11. 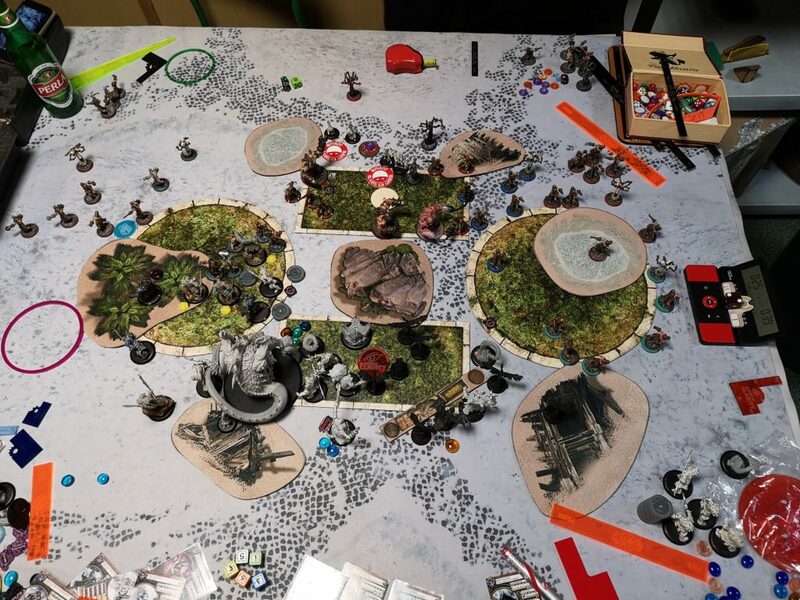 I couldn’t do much as I was really low on clock and Thexus was totally safe, Tomek won on scenario. As I predicted the game was intense till the very end. 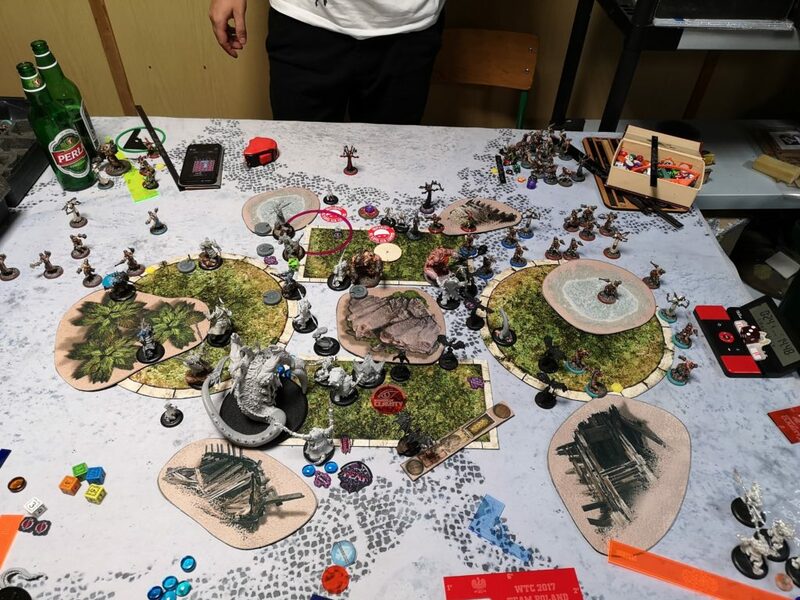 The model count advantage and right positioning turned into an attrition advantage for Tomek. It was a truly interesting game. As soon as I reveceive Chosen I would need to try another version of the list versus such a horde of models, I’m curious how their survivability can influence the attrition game. I certainly exposed too many Ogruns and overestimated their potential to take a punch.